New Vfuel Flavors Coming Soon! With the increase in demand for VFuel growing quickly, we have sold out of Vanilla and Peach Cobbler VFuel! We have more product well on its way to your tummy as production is going on right now! We will continue to offer Vanilla and Peach Cobbler VFuel but will be discontinuing Chocolate in favor of it's offspring, Fudge Brownie. Don't worry, if you are one of the many fans of our Chocolate flavor, you will LOVE Fudge Brownie. We have sourced a new organic cocoa that is second to none! A complete and well-rounded chocolate flavor that we couldn't simply call chocolate. It's just too good! Totally new flavors! We had a few flavors ready to go but we settled on just two more for now. 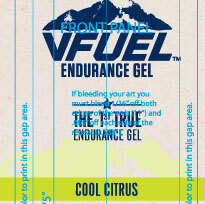 We will be adding Maple Bacon and Cool Citrus to the VFuel family very soon! Maple Bacon will have increased electrolytes for those that want a bit more salt when out training. And it will have that distinct smoky, maple bacon flavor, that so many love! We know that you crave something a little different when out for a long run. When sweet gels just don't appeal as much or when you just want to change things up! But Maple Bacon has become our go-to gel in day to day training. It's many of our beta testers and athletes favorite gel they have ever put in their mouths! And with the massive benefits of being VFuel, it's a win-win! And then Cool Citrus. It is what it sounds like. Cool, refreshing, light, and crisp. We have a feeling this one is going to trump Peach Cobbler as our best seller. You're about to taste the best citrus gel on the market, hands down. We're super excited about the growth we're experiencing and about adding these new flavors. We know you're going to love them! We'll let you know as soon as they are ready to purchase! We're guessing that by mid-March we will have it all inventoried and ready to ship! Keep an eye on our Facebook, Twitter, and Instagram accounts (and here on the blog) for exactly when it will all be ready! Thanks for your patience!